We’re excited to announce that we’ve teamed up with Avery WePrint to give our customers an easy way to get custom printed labels for consumer aluminum bottle products. For labeling consumer products such as lotions, cosmetics, colognes and room sprays, you can choose from a wide variety of professional materials and finishes and then upload personal artwork or use the free Avery design tools to custom design your own artwork on your label. Simply upload your artwork or use the free Avery online templates to create your ideal labels without the need for a graphic designer. 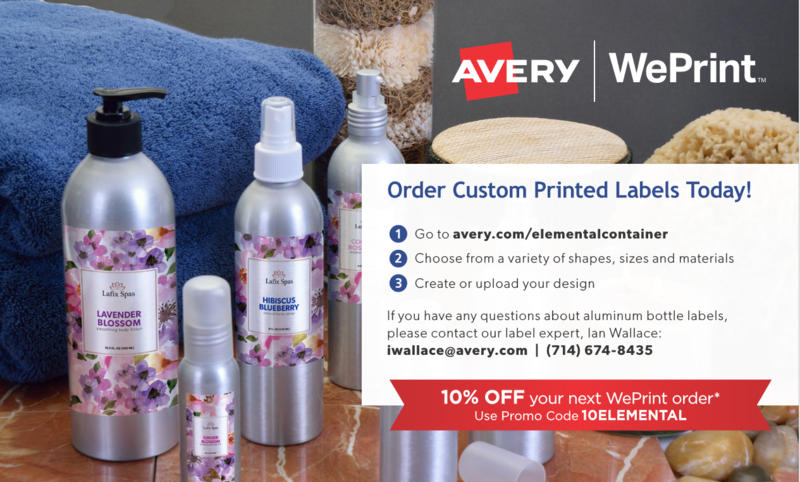 Get 10% off each order simply by visiting Avery WePrint, and use the code 10ELEMENTAL to redeem your discount.